I am participating in the Chicken Farmers of Canada campaign to bring you an easy chicken dinner meal. I received special perks in exchange for my participation in this campaign. The opinions on this blog are my own. I have to admit something: I have never decorated a holiday table! It was always my husband’s favorite thing to do! My decorations skills lack creativity (per my husband). I am not offended when he says that! Because I do like decorating (and I believe I have some decorating skills) but I lack the time to do it! Between shopping for the holiday recipe, preparing it, cleaning the house, etc. The table decoration is the least of my concerns! So I let the man in my life take charge of this and he is proud of it! (you know that little trick that women do: make them feel important and let them help you! ) But this year I decided to take charge of my holiday table! I felt it was time to showcase some skills to the man in my life! I headed to my favorite store: Winners Homesense! I get most of my decorations there! Of course, I spent hours on Pinterest searching for the perfect table decorations and none of them was satisfying enough! The only thing I knew before heading to the store was that I wanted a red theme because I have red and black plates! I found gorgeous ideas at Winners! I bought a nice table cloth, the matching sets as well as candle to use as a centerpiece! I was just afraid it was too much red! But I remembered I had nice white glasses at home to alleviate the red! I don’t want my guests to feel that it was too much! I came back home, excited with my findings! I set up the table (with the help of my children). I did not involve my husband. My ego did not want that. I wanted to impress! Once the table set, I went to cook a nice meal to serve! I wanted to find an easy chicken dinner meal that everyone would love. Since I spent most of my morning shopping for decorations and decorating my table, I chose a nice easy recipe that is also suitable as a holiday meal. You don’t want to spend your day in the kitchen when you are having guests over? Do you? I recreated a recipe from Chicken.ca website! Again, I spent a long time looking for a holiday recipe! They have a large selection of recipes that it was hard to choose! I chose the Broccoli and chicken casserole! 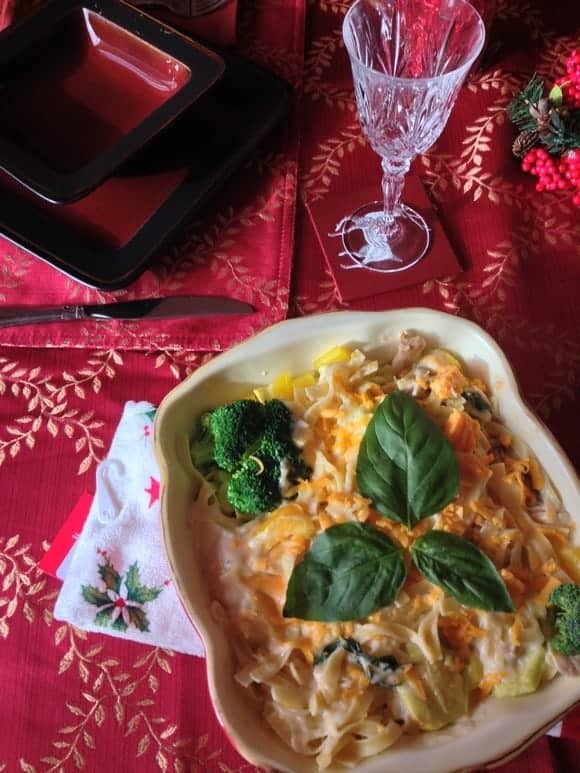 I usually serve casseroles with my holiday meals because they are easy to make and very popular with the kids! They can be served as a complement or as an entire easy chicken dinner meal. During the last minutes of pasta cooking: add the vegetables! 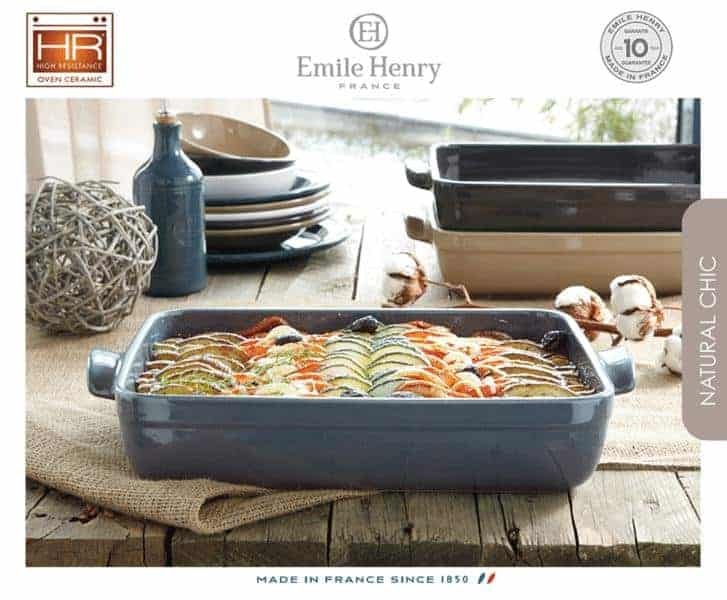 Spray a 9 X 13 –inch oven-proof casserole with a non cooking spray! And you have a delicious easy chicken dinner meal within 30 minutes! 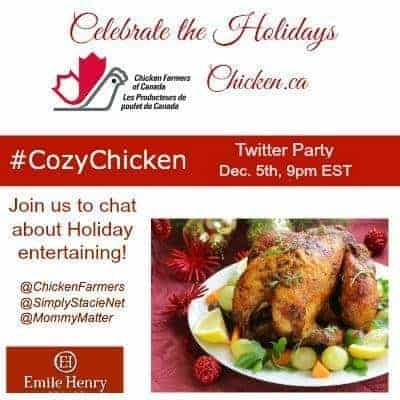 Chicken Farmers of Canada want to help you celebrate the holidays and all the fun cooking that goes along with them! Second, in order to help prepare for the Holiday season, the fine folks at Chicken Farmers of Canada are providing an amazing prize pack for one very lucky Canadian reader! Entrants must be 18+ to enter and will have 48 hours to respond. This giveaway will run from 30 -­‐ Dec 14th. Wow, you could make an amazing easy chicken dinner meal with all that! Connect with Chicken Farmers of Canada on Twitter, Facebook and Pinterest to get news and great recipes! What do you think of this easy chicken dinner meal? Do you like my table setting decor? Think I can take over the job from my husband? Childhood Cancer: Is Your Child at Risk for the Most Common Types? This looks so good! I’ve never seen a chicken casserole recipe like this one! It’s difficult to find educated people for this subject, buut you seem llike you know what you’re talking about! Looks so delicious and easy to make and from ingredients that are always in the house. Thank you for the great dinner idea and recipe! 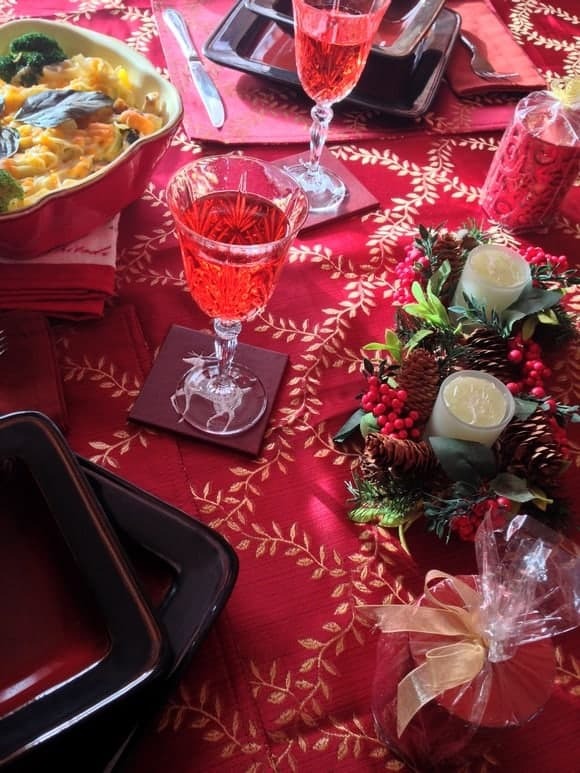 I’m laughing I’m not much of table decorator either… though I have tried to fold napkins in the shape of Christmas trees…. 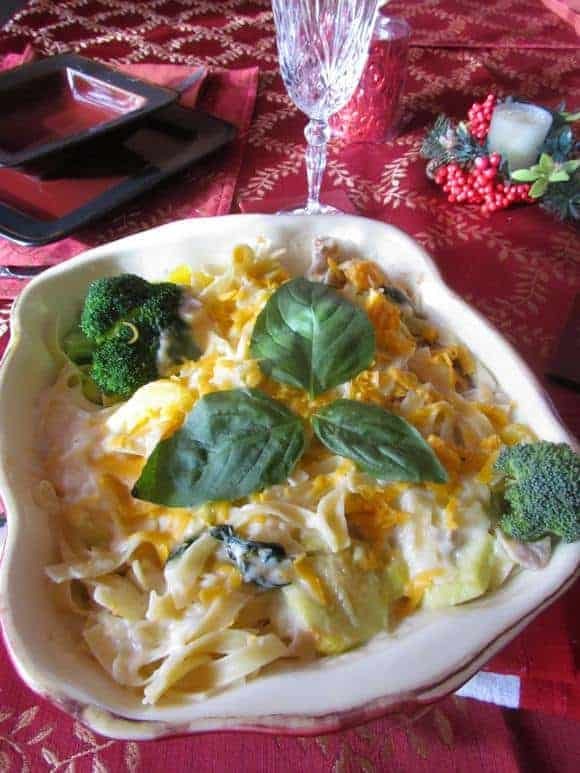 your casserole looks very tasty thanks for bringing it by foodie friday. This sounds wonderful. Thanks for sharing on Foodie Friends Friday Meals for 30 Minutes Party. What a lovely table setting and presentation for your delicious Chicken Dinner. Thanks so much for bringing this awesome recipe to Full Plate Thursday today and have a great weekend! Thank you so much for stopping by The Weekend re-Treat this week and sharing this post with us! Wanted to stop by your blog and Pin it to our Party Boards while I was here tonight ! Yum! I pinned this and I had to stop by to tell you how delish it looks! Thanks for sharing. my bf makes an awesum butter chicken. My favourite dish to serve is baked BBQ chicken. General Tao chicken over plain rice. I usually go with Butter Chicken….unless it if for my sister then it’s Chicken à la King (her favorite). I like Honey Garlic with Sesame seed baked chicken served with a pasta side. Oven fried chicken made with a bisquick coating, baked potatoes and brussell sprouts with butter sauce! Yumm, now I’m hungry! Crock pot buffalo chicken! Mmmm I want to make some now. i love making chicken cordon blue~! This looks like a lovely meal and a great one for lunch or as a side dish for dinner. Thanks for sharing. Your table setting is so pretty! That looks delicious! My daughter won’t eat noodle casseroles, so more for me. Your table settings are beautiful. I was just thinking today that I need to get a Christmas-themed tablecloth. I love fried chicken, especially when my mom makes it! Parmesan chicken is my fave! I love making chicken curry. We love to barbecue chicken & veggies skewers! Butter Chicken is my go to dish to serve! roast chicken with all the veggies..yum! I love making Butter Chicken with Naan! I love making Butter Chicken with Basmati rice. My favorite chicken dish to serve is Beer (I use the non-alcoholic Beer ) cooked BBQ chicken! I like to cook either a baked chicken or chicken tacquitos are a big hit. Sounds yummy – but 1 question….. when does the chicken get added to the casserole? All I can say is yum! The dinner looks absolutely scrumptious and I love your festive decor. Great job! Thank you so much Stacie! I am so proud it turned out great! I love to make the cheesy buffalo chicken. I like to make chicken parm. I love making chicken Cordon Blue. Thanks for the chance to enter. One of my favorite dishes is Chicken wrapped with bacon and topped with swiss. I prepare it in the crockpot. This looks delicious, Olfa! Your table looks lovely, I’m also a HomeSense fan. Thank you Heather! It is delicious and I am such a huge fan of HomeSense!